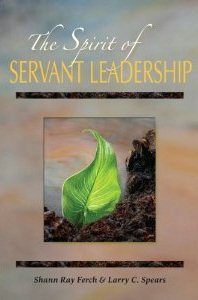 We’re pleased to announce that signed copies of The Spirit of Servant-Leadership are now available in our store. The latest in a series of anthologies by world-renowned servant-leadership expert Larry Spears includes an essay by Lane, who is highly regarded in servant-leader circles for his passionate promotion of the philosophy and his unique, “on the ground” insights into incorporating the principles into business and personal life. After heading the Greenleaf Center for Servant-Leadership for seventeen years, Larry Spears founded the Spears Center for Servant-Leadership in early 2008. Shortly thereafter, he invited Lane to serve on the board of trustees. Since then, Lane has worked closely with Spears to advance servant-leadership and help spread the philosophy to new audiences. Calling Lane “a dynamic voice and passionate leader,” Spears invited Lane to submit an essay for consideration for this latest addition to Spears’ work. As it’s name implies, Lane’s essay Learning Servant-Leadership from Native America – Again compares the two leadership models, showing the many similarities between the two. The second half of the essay offers ideas on how we can adopt Native American teaching methods to help grow more servant-leaders. Lane continues to work closely with Spears, and will be featured in another book to be released soon. 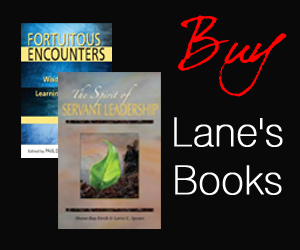 The Spirit of Servant-Leadership is now available in our store, with all copies personally signed by Lane. Leave a comment below to tell us what you think of this post. And don’t forget to LIKE it, OK? Please SHARE this post with all of your friends!